How Is Caregiving for a Loved One Who Has Had a Stroke? The “MyTherapy” blog invited ClotCare to share the following post in support of World Stroke Day, which is October 27th. For patients at risk of stroke who do not adhere to their therapy, I often will try to impress upon them how devastating a stroke can be to their life and lifestyle. But I frequently do not address how a stroke may affect their loved one; Diane’s story (pasted below), however, illuminates this issue. Each year, over three-quarters of a million people have a stroke in America. The impact of a stroke affects the life not only of the individual concerned, but those of friends, family, and loved ones, who often take on the role of caregiver. The responsibilities this sudden change entails are emotionally and physically demanding, and support can be difficult to find. As World Stroke Day 2017 arrives this weekend, Diane from The Pink House on the Corner shares with us her story of caregiving for her husband, Bob, whom she chose to bring home following his stroke. In 2010, my husband, Bob, suffered a massive stroke post-surgery. After a two-month hospitalization, he was transferred to an Acute Rehab Center where he was pronounced, as the doctor put it, “nursing home material”. Bob was 52 years old — not “nursing home material.” It was true that Bob could not walk, talk, swallow, could not stand, and had to be transferred from hospital bed to wheelchair with a Hoyer Lift. Still, I was adamant to take him home. In my mind, nursing homes were for the old, sick, dying, and Bob was none of these. The doctor, against my wishes, proceeded with the admission process to a nursing home. Imagine my surprise when a representative from a nursing home showed up at the hospital, armed with a glossy brochure and a sales pitch about the facility that was so great, they even tried to provide 3 “units” of therapy a day. Though, of course, that depended on staffing. A “unit” of therapy turned out to be 15 minutes. That would mean Bob would get 15 minutes of physio therapy (PT), 15 minutes of occupational therapy (OT), and 15 minutes of speech therapy (ST) each day (maybe). When I refused, I was told they didn’t need my permission — it was out of my control. Of course, I argued. With the doctor, the case manager, all the way up to the director of the hospital, without luck. My fear was that Bob would not last long in a nursing home with a patient/nurse ratio of 8 to 1. He would not recover with 3 “units” of therapy (maybe) per day. I could give him better care at home. Then a “miracle” happened. The nursing home wanted $3,000.00 before Bob could be admitted. I told them I didn’t have the money. Sometimes it pays to be poor. Bob was discharged, in my care, on New Year’s Eve 2010. Me: who never changed a baby’s diaper. Me: with expectations that there was “help” out there for at-home caregivers. I did contact every agency that I could find, only to be told that Bob did not qualify for programs. He was too young, because he was under 65. He was too old, because he was over 21. We were “too rich,” as Bob’s social security disability (SSD) check was $200.00 over the income limit. I did manage to get a wheelchair ramp for the house, provided by one charity. I did get him wheelchair transport through the county bus system. I did find a financial aid program through a not-for-profit hospital that paid his co-pays for outpatient rehab. I did get help for the first month through Bob’s insurance. We had a nursing assistant (CNA), for changing and bathing, and a nurse to teach me how to manage his meds, his feeding tube, and how to work the nightly feeding pump. But after four weeks, insurance ran out and I was on my own. I was not prepared that much of caregiving involves bodily fluids: adult diapers, urinary incontinence, daily laundry – all of which was overwhelming. I remember, that first week sitting on the back porch late one night behind a heap of urine soaked bedsheets, crying and wondering if I was really able to pull this off. No one told me about condom catheters – I found this out a year or more later. These helped both Bob’s comfort and my cleaning up after him. No one explained that the feeding tube was not “permanent” and should be changed out every 8 weeks – this I discovered on my own, much later, and if I had known this it would have saved us countless trips to the ER for a clogged tube, and countless hours on my own unclogging the tube. God bless the nurse who told me it was not necessary to have a daily bowel movement. The hospital had discharged Bob on a daily laxative, which meant constant diarrhoea. This nurse taught me “bowel movement management,” giving laxatives only when necessary. One of the hardest and most heart-breaking tasks was trying to keep his therapy going – I would take him to PT, ST, OT three times a week, pushing him there in his wheelchair, and though he showed improvement (being able to walk holding onto the parallel bar), the therapy was ended for “no functional improvement.” So, I had a railing installed in our hallway where Bob could practice walking, with me pushing the wheelchair behind him, and holding him up with a gait belt. I developed our own speech therapy and we practiced daily. I did this after the speech therapist insisted on using pictures for him to point at and teaching him gestures. Bob was good at repeating things and I used his ability; I would say a sentence, and he repeat it. I did his range of motion to keep his paralyzed arm and leg from freezing up. I bugged his primary care doctor every six months for a new script for outpatient therapy where they have special equipment, things we didn’t have at home. Each and every time, it was like starting from “square one,” and the insurance would stop after 8 weeks for “no functional improvement,” which never failed to shock me. Another shock was the way people treated Bob post-stroke. “Baby talking” to him as if he were a child or an idiot. Talking over his head, to me, as if he wasn’t in the room. Shouting at him – as if he couldn’t hear. The friends and family who fled – as if stroke is contagious. Bob was still the same person just trapped in a disabled body. I wanted people to treat him with respect. Speak to him normally. Include him in conversations. Have patience as it sometimes took him time to respond. To listen. Visit. Make a phone call. Only a few did. I am grateful for those few. There were other battles too, fighting for adequate pain medication, fighting for medical equipment and supplies, including a power wheelchair – the doctor insisting that Bob couldn’t manage it, and me arguing to at least let him try. That doctor, finally, ordered a powerchair, on the condition that it had an attendant control so that I could “drive” it. The first time I attempted to “drive” it, I plowed Bob straight into a wall. When Bob took control, he zoomed around the room. I learned over the years to stick to my guns, follow my gut, and fight for my man. Caregiving is hard. Frustration, anxiety, stress all build up. You find yourself crying, screaming, angry (Why us? Why me?). There is no time to take care of yourself, to sort out all these emotions. So you take a deep breath. Tough it out. Ignore that cold that doesn’t go away. Or that suspicious looking mole. Cut your own hair. Hope for the best and concentrate on caring for the one you love. Then there’s grief. Grief over the loss of the man he once was and would never be again. Grief over a relationship that has changed from equal partners to caregiver/patient. Blogging was one way I was able to vent/rant about the frustrations and anxieties of caregiving. I started my blog shortly after Bob came home. It was the one thing I could do for myself, steal 15 minutes a couple of times a week. I began blogging to keep my “hand” in writing (my profession) and to keep our family and friends informed, but strangely it turned into something else. I didn’t realize there is a whole “stroke community” out there, where I “met” stroke survivors and caregivers around the world and appreciated their support, their stories, and just knowing that we were not alone on this journey. Caregiver burnout is real. There were many days when I felt I just could not “take it” any longer. Nights crying on that back porch then wiping away the tears and returning to my duties, putting on a smile for Bob’s sake. All that said, I wouldn’t change a thing (well, except for the stroke part). I am glad I was able to care for Bob at home. I cherish memories of quiet nights, watching a movie, holding Bob’s hand. Memories of “hand dancing” to a song on the radio. The nightly I love yous called to each other across the room. The way he would sing while doing his therapy exercises. The triumphs, like the first (and only) time he was able to stand up with a hemi-walker. Every new muscle movement he regained. I deeply admire his courage and strength and motivation to never give up, never stop trying. To accept the things he could not change with a shrug and an “oh well.” Near the end of his life, though he was still not able walk or swallow, he could “tool around” (his words) in his powerchair and speak entire sentences. I’m sure he would’ve never accomplished those things in a nursing home. Bob was able to spend his last five years in the comfort of his own home, with his two beloved cats, our dog, and with me by his side. For that, I will always be grateful. Bob passed away on May 28th, 2015. We would like to thank Diane for contributing this guest post. September 18, 2017 5:39 pm / 1 Comment on Rivaroxaban or Warfarin in Stable Coronary Artery Disease – Should the COMPASS Study Lead Us Back to the Future? An Update on Testosterone Supplementation and Venous Thrombosis by Charles J. Glueck, M.D. 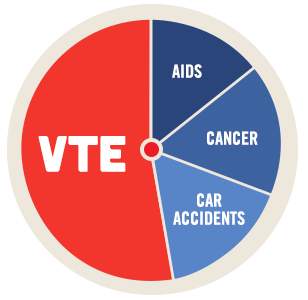 Venous thromboembolism (VTE) includes blood clots in the legs (known as deep vein thrombosis or DVT) and blood clots in the lungs (known as pulmonary embolism or PE). Whether testosterone supplementation therapy (TT) increases the risk of VTE, heart attack, and/or stroke remains at least somewhat controversial. Earlier work (cited above in the editor’s note #1) has suggested that TT, when administered to individuals with conditions that predispose them to clotting, does indeed carry a substantial risk of VTE. The information reviewed below provides further support for this position. Editor’s Note #2: TT may be administered by injection, topical gel, or topical patch. The injectable form is thought to provide higher peak levels of testosterone while the topical preparations provide lower but more sustained concentrations. To assess the safety of these formulations, Layton and colleagues performed a retrospective study of 544,115 TT users. Among this very large group of TT users, 37.4% received injections, 6.9% used the patch, and 55.8% used the gel formulation.5 It is important to note that there was not a non-TT control group. The risks (reported as hazard ratios and 95% confidence intervals – or CI) were higher for those receiving TT by injection. When compared to those receiving gel TT, the injectable group had hazard ratios of 1.26 (CI 1.18 – 1.35) for cardiovascular events (ie, heart attack, stroke, and angina), 1.16 (CI 1.13 – 1.19) for hospitalizations, and 1.34 (CI 1.15 – 1.56) for death. The hazard ratio for VTE, however, was not increased (0.92, CI 0.76 – 1.11). The event rates in the small portion of patients who used the patch, were virtually identical to the rates seen with gel use. Although the retrospective nature of this very large study weakens the findings, one might well conclude that the gel or patch may be safer forms of TT. It is important to note, however, that efficacy was not evaluated in this study and that one cannot draw any conclusions about the safety of these agents vs. no TT from this study. Martinez C, Suissa S, Rietbrock S, Katholing A, Freedman B, Cohen AT, et al. Testosterone treatment and risk of venous thromboembolism: population based case-control study. BMJ. 2016; 355: i5968. Glueck CJ, Lee K, Prince M, Jetty V, Shah P, Wang P. Four Thrombotic Events Over 5 Years, Two Pulmonary Emboli and Two Deep Venous Thrombosis, When Testosterone-HCG Therapy Was Continued Despite Concurrent Anticoagulation in a 55-Year-Old Man With Lupus Anticoagulant. J Investig Med High Impact Case Rep. 2016; 4(3): 2324709616661833. Glueck CJ, Prince M, Patel N, Patel J, Shah P, Mehta N, et al. Thrombophilia in 67 Patients With Thrombotic Events After Starting Testosterone Therapy. Clin Appl Thromb Hemost. 2016; 22(6): 548-53. Miettinen OS, Caro JJ. Principles of nonexperimental assessment of excess risk, with special reference to adverse drug reactions. J Clin Epidemiol. 1989; 42(4): 325-31.